Yesterday I wrote an article about how Nokia and Motorola were struggling to gain leverage in the smartphone market in Europe, and we learned that carriers in the EU were very direct in saying that Nokia simply cannot compete with Android and IOS devices. 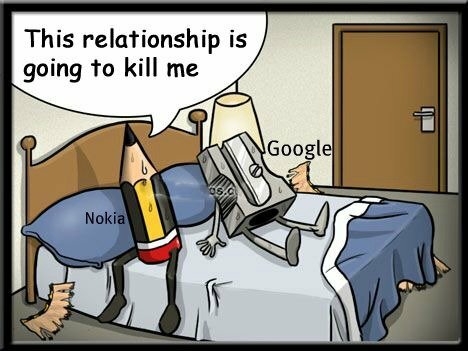 But here's a fun fact for you: Did you know that Google offered Nokia to use Android before they chose to partner with Microsoft? It's true! In fact, they spent a lot of time with Google discussing the option, but in the end decided to go with Microsoft as their operating system of choice. Nokia shares are currently at a 15 year low, so I think it's pretty fair to ask 2 questions: 1.Why didn't Nokia choose Android instead? and 2. Do they regret their decision? The answer to both questions might seem obvious, but the situation is actually a lot more complex than it seems. It's hard to believe that just a few years ago, Nokia literally DOMINATED the smartphone market. Fastfoward to 2012, and we see that they now currently hold 1 percent of the smartphone market. That's not a typing error folks. 1 percent. So what happened? How could a company that had the mobile market in their left pocket and billions of dollars in revenue in their right literally lose 99% of their marketshare in just a few short years? The answer to that question is simple: The iPhone and Android. After telling a story of a man trapped in a burning building and having to make a decision how to survive, he said "We too, are standing on a "burning platform, and we must decide how we are going to change our behavior". After citing Apple's incredible growth (from 25% to 61% in less than 2 years) he spoke of Android and stated: "And then, there is Android. In about two years, Android created a platform that attracts application developers, service providers and hardware manufacturers. Android came in at the high-end, they are now winning the mid-range, and quickly they are going downstream to phones under €100. Google has become a gravitational force, drawing much of the industry's innovation to its core. “While competitors poured flames on our market share, what happened at Nokia? We fell behind, we missed big trends, and we lost time. At that time, we thought we were making the right decisions; but, with the benefit of hindsight, we now find ourselves years behind. The first iPhone shipped in 2007, and we still don't have a product that is close to their experience. Android came on the scene just over 2 years ago, and this week they took our leadership position in smartphone volumes. Unbelievable“. That last quote I find extremely powerful, as the CEO of the once most powerful mobile force in the world publically states that Google and Android have literally brought them to their knees in just 2 years time. Those are just a few quotes from the letter, and I encourage you to read the entire thing if you're interested in a good read. He goes on to literally say that the Nokia platform is burning and asked "how did we fall behind when the world around us evolved?“, which sunk pretty deep into the hearts of employees at Nokia. Nokia has always had respect for Google and Android, and the Nokia CEO doesn't hesitate to publically state that. In fact, the possibility of Nokia running the Android operating system on their devices is also something that he agreed could work, as he stated that: "Android is growing very nicely; it has significant market share. Nokia could bring to the Android ecosystem [a] very large number and would signal a very substantial shift in the dynamics of the mobile operating system market.“ So Nokia clearly stated they could fit nicely into Android's ecosystem, and Google was also ready to make it happen. But why didn't it? The answer to why they didn't and for which reasons will shortly follow in part 2 of this article. IMHO the answer is simple. Elop is a mole sent by Microsoft. But their plan to buy themselves into the biggest manufacturer just didn't work well, they didn't think it would go downhill just that fast.